Quinten turned two yesterday. It’s very fitting with his personality lately. He talks non-stop from the minute he wakes up to the last second before he falls asleep. No, really. The other night Maximus was turning on a nightlight and Quinten was yelling at him. “Dehdeh! Nooooo!” Most of the time he speaks in three to five word sentences. He’s great at copying Maximus with stories or giving play-by-play commentary. It’s pretty awesome watching a little guy take in the world. I forgot how cool this stage is. For all the tantrums that are to come, the learning part is important to remember. Yes, that’s what Quinten calls his brother. No, we don’t have any idea where it came from. Yes, sometimes he can say Maximus. In the best two-year-old voice. He’s been rocking the 28-29 pound range for a long time. I didn’t see his height but he’s been getting a little taller, which makes him look a little smaller. The blonde hair on his head helps him look older, too. Like his brother, he’s currently obsessed with all things movable. Everything with wheels gets pushed around our house. (And fought over.) He got a lot of car toys for his birthday and has actually been playing with Maximus. We had a Little Blue Truck party so they’ve been play Little Blue Truck. The best thing about the new toys? They are both entertained and can be distracted by something new if they start fighting over the same toy. I imagine that two will be a challenging year for Quinten. And it might be even more challenging for the parents as we navigate life with an preschooler AND two-year-old. Two was hard enough with just one kid! 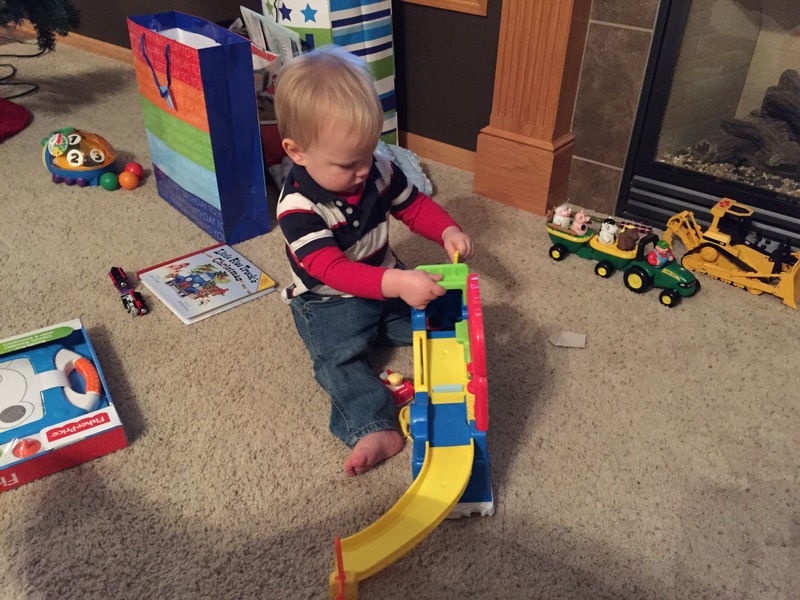 This entry was posted in Baby, Quinten, Toddler and tagged two year old by Kyley Leger. Bookmark the permalink.